Looking for an easy, healthy and delicious breakfast creation? Well then look no further! This week, I made ‘Slow Cooker Apple Cinnamon Steel Cut Oatmeal.” The recipe was extremely simple and effortless, yet resulted in a mouth-watering delectable meal. If you haven’t already noticed, I love my slow cooker, and am constantly looking for new recipes to try out in it! Since I’ve been getting tired of my instant Quaker oatmeal each morning, I decided to spice it up by making a big batch of steel cut oatmeal, which surprisingly has several health benefits. Steel cut oats not only stabilize your blood sugar, but they also have an excellent nutritional profile (1/2 serving of cooked oats is only 150 calories, 4 g of fibre and 5 g of protein). 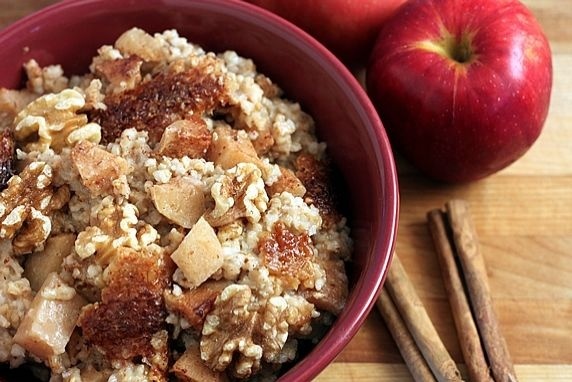 Also, there is nothing better than a cup of warm steel cut oats with fresh apples and cinnamon in the morning! My batch made 5 servings, which I stored in the an air-tight container in the refrigerator after preparing. Each morning, I took out about 1 cup, added 2 tbsps of water, and heated it in the microwave for 2 minutes. Delish!! I highly recommend this recipe to anyone who loves oatmeal! Finally, feel free to top it with anything your heart may desire…raisins, nuts, cranberries, brown sugar….the possibilities are endless!